NOTE : THIS AIRCRAFT WAS STILL FLYING IN DEC 2012 ! Det 12, 42 ARRS at George AFB, CA , chalked up a couple of "firsts" as 1970 drew to a close. The detachment became the first Local Base Rescue unit in the United States to receive a HH-43F and was also the first unit to ferry a HUSKIE 2800 nautical miles across the country. The HH-43B, serial number 59-1556, was re­designated a "F" after being fitted with the more powerful T53-L-11A engine at Kaman's Bloomfield, Conn., facility. At that time (1970) , HH-43F's were operational with the USAF in Southeast Asia, the IranAF and Army, BurmaAF and MoroccoAF. Those in Southeast Asia, in addition to the new engine, were outfitted with special equipment including armor plating. 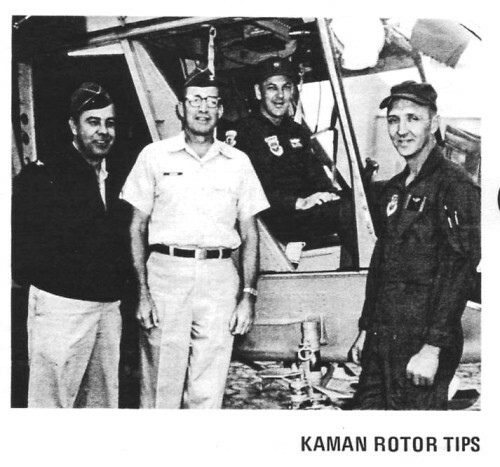 Maj James L. Wissert, Det 12 commander, headed the ferry crew which accepted the George AFB "F" at Kaman. Other crewmembers were Capt Robert A. Sheppard from Det 17, 42 ARRS, Davis-Monthan AFB, AZ., copilot, and SSgt Robert E. Crites, a helicopter mechanic from Det 12. The crew departed Bradley International Airport, CT., on Oct 20th, 1970 . Twelve days and 2800 nautical miles later , 556 arrived at the California base (Nov. 2nd). The trip, which traversed 18 states and the District of Columbia, is the longest HUSKIE ferry flight on record. It took 37.9 hours flying time at an average of 70 nautical miles per flying hour for the entire trip. Field elevation at George AFB is 2800 feet and Summer temperatures often exceed 110° F. The F-model HH-43 will vastly improve Det 12's ability to perform its mission, both fire suppression and rescue and recovery, especially during the summer months. 2800-Mile Flight-Posing for commerative photograph after delivery of HH-43F to George AFB, Calif., are, left to right, Col Walter T. Steves, commander, 479th Combat Support Group; Col Earl J. Archer, Jr., commander, 479th Tactical Fighter Wing; Maj James L. Wissert, Det 12 commander, and SSgt Robert E. Crites, also from Det 12. With Major Wissert and Sergeant Crites on the HH-43F ferry flight was Capt Robert A. Sheppard from Det 17, 42 ARRSq, Davis-Monthan AFB, Ariz.
Det 12, 42nd ARRS, George AFB, CA has added another to its list of "firsts." A couple of months ago the detachment became the first local base rescue unit in the United States to receive an HH-43F . Now , Det 12 has become the first to record "stateside saves" with the HH-43F (serial 59-1556). The mission began when the San Bernardino County Sheriff's Office notified the detachment that a 12-man rescue team was stranded in the vicinity of Ontario Peak. The team had gone into the San Gabriel Mountains to search for an injured hiker, however, helicopters which had taken the men into the mountains were unable to retrieve them due to dense fog in the area , "Pedro 58" took off and headed for the mountainous area. Maj James L. Wissert, Det 12 commander, was pilot, Maj Lyle A. Beck, copilot; and SSgt John L. Hatch, helicopter mechanic. Sgt O. C. Gray from the Sheriff's Office accompanied the crew and provided two­way radio communications with the men in distress. Eight of the rescuees were located in a box canyon in a small rocky clearing surrounded by tall pine trees at the 6,000-foot level. Due to the rocky terrain, a low hover was maintained and three of the individuals were picked up. During the pickup, Major Beck noted that a landing could be made at a small spot about 10 feet from the hover area. The three rescuees were taken to a road a few miles away. The helicopter then flew to the 8700-foot level on Ontario Peak and landed on the hard-packed snow. Four other members of the ground party were picked up and airlifted to George AFB. After refueling, the HH-43F returned to the first site, picked up the five remaining persons and took them to the road where vehicles from the Sheriff's Department were waiting. The survivors were all hungry and tired but otherwise unmarred by their experience. Personnel from the Sheriff's Office said, however, that it was doubtful whether the four men at the 8700-foot level could have made it through the night had they not been rescued. This was due, they said, to fatigue, lack of food, and the fact that snow and water in the area made wood damp and it was impossible to build a fire to keep warm. Four saves were credited.